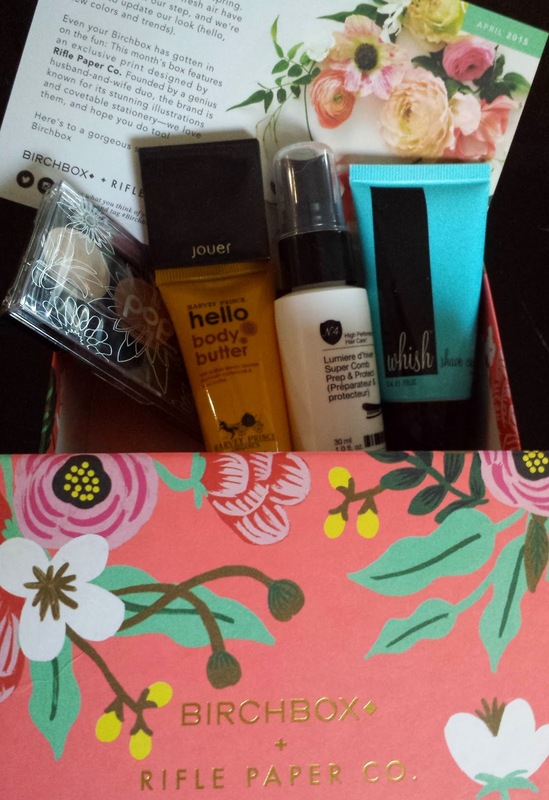 Hey hey hey, it's Birchbox day! Discover new gems and sample away! There's something about this month's box that made me happy as soon as I saw it. The design, perhaps? It's very cheery. I'm really digging the change-up in box designs every month. I mean, I like a brown box as much as the next gal, but it's nice to see some color once in a while, ya know? I think April's may be my favorite design yet. I'm tempted to buy something from them just because I like stationery. And dogs. I'm thisclose to buying those dog coasters. And it's on sale for half off!! Whish Shave Crave Shaving Cream - Blueberry (0.75oz value: $3.20) - I already have shaving cream coming out of my ears but for some strange reason I cannot turn a new one down. I've tried the acai grapefruit scent from this brand before and thought the cream was a bit thick and it clogged up my razor quite a bit. Not that it's a deal breaker, but rinsing your razor out after every stroke does get old pretty quickly. At least I like this scent better than the grapefruit one. It's really sweet but I like sweet. Smells like Sweet Tarts. Harvey Prince Hello Body Butter (0.5oz value: $1.25) - There's only been one Harvey Prince scent that I've liked so far and that's Ageless. 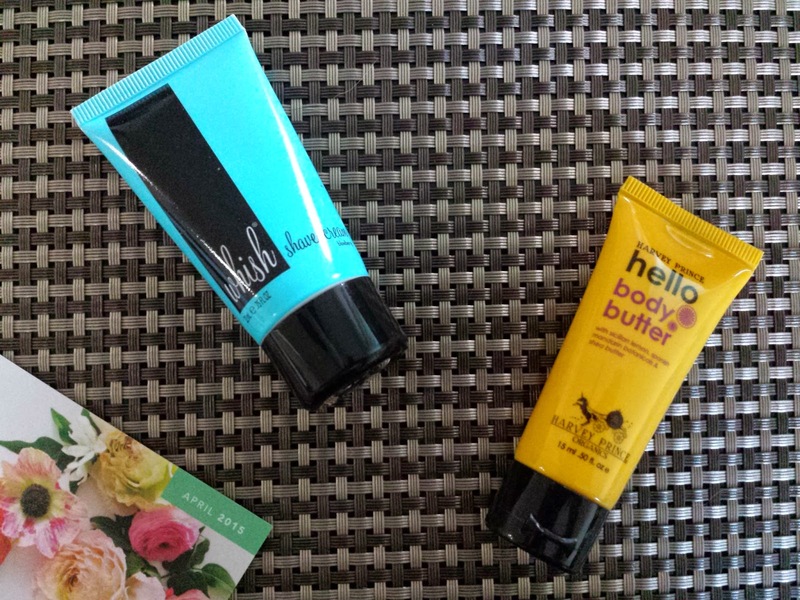 Hello body butter is a blend of Sicilian lemon, Spanish mandarin and plumeria extracts, plus the Hello perfume. This has a playful scent but it's a bit too perfume-y for me. Jouer Tint - Petal (0.03oz value: $9.40) - This is a cream lip and cheek tint. 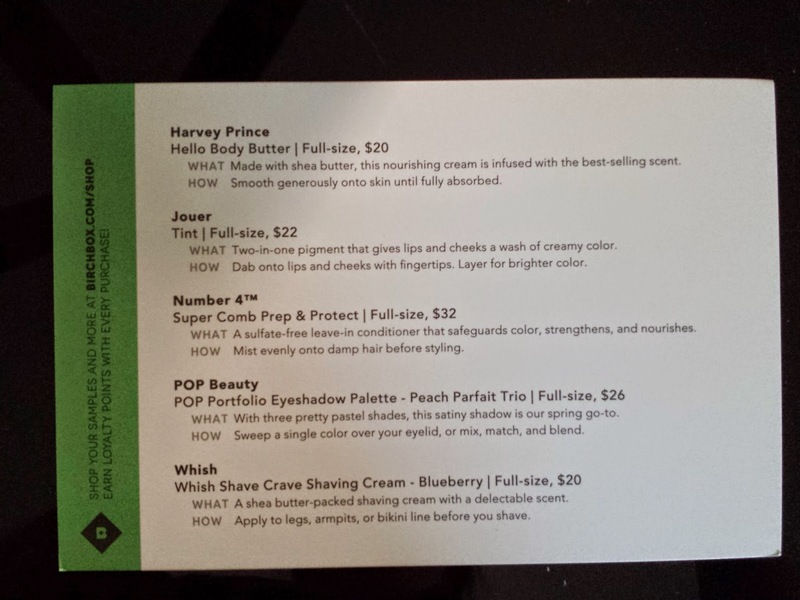 I've never tried Jouer's makeup line before, and this is supposed to be pretty sheer...sounds promising. It also has a magnetic closure like theBalm samples. Add a magnet to your sample and I'm sold. I'm easily won over like that. Pop Beauty POP Portfolio Eyeshadow Palette - Peach Parfait Trio (Sample value: ~$2) - I've collected a whole bunch of these palette trios but I have yet to open one. What the heck, right? I feel a weird compulsion to collect mini palettes but hardly ever stray from my regular daily shadows. On the bright side I think this is my favorite of the POP trios based on the color combo alone. There's a beige, pink, and brown, all shimmery. Decent box. 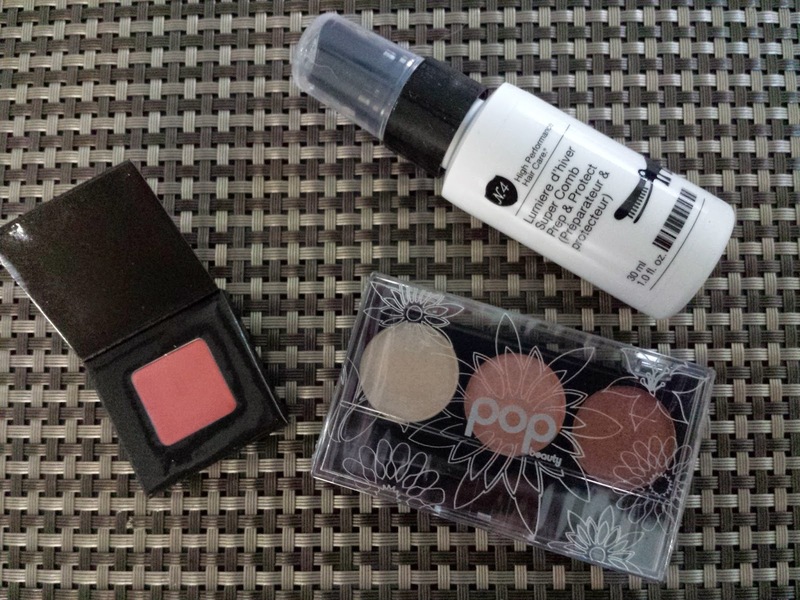 It's not a super great Birchbox month for me, but whatevs, right? You win some you lose some. At least I didn't get the shampoo/conditioner duo that I've seen in almost every single April box. I thought this was a very nice mix of stuff from makeup to skin and hair care, but it was just a scent preference thing. I can't blame Birchbox for trying to be happy and scentsy(??) during spring. It's not their fault I'm so boring. May's next! I'm really hoping they don't run with the April showers bring May flowers idea... there's only so much floral one can take. 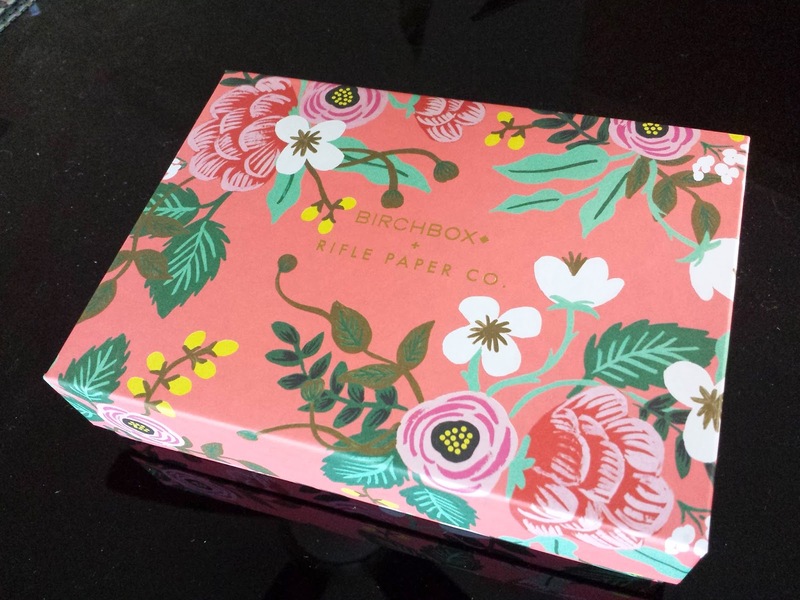 If you want to jump on the Birchbox bandwagon, please sign up here. Your beauty routine will totally thank you. And I'll thank you for using my link too! The colors in the POP trio are pretty. I have a different trio that I got from Ipsy 800 years ago and I only use one of the shades - is that weird? Better than not opening it at all, maybe. Not weird at all. I usually end up using only one color in my palettes too. :) But at least you opened your POP trio!